I wanted to do something epic to celebrate my 40th birthday this year and October 22, 2017 was the epic culmination of this year’s “celebration”. 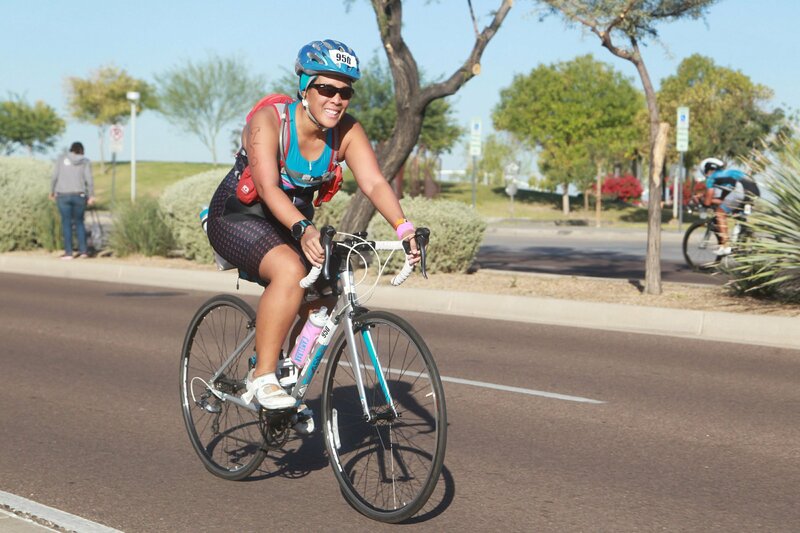 I got a tickle to sign up for the half iron distance triathlon (a 1.2 mile swim, 56 mile bike and 13.1 mile run). 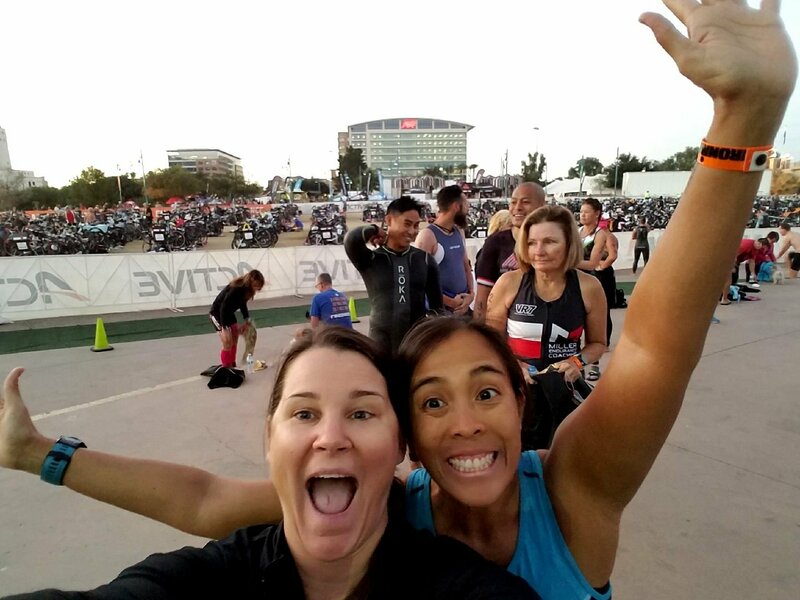 The half iron distance appealed to me because I’m familiar with the half marathon distance run, so I thought that adding the bike and swim would be a great challenge. 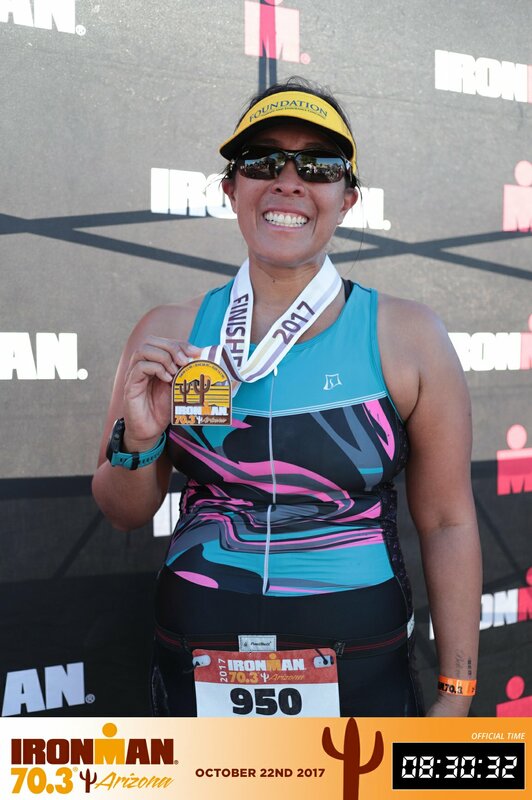 The hubby and I joked that this was my “tri baby” – it was about 10 months of preparation, of readjusting the family schedules, of early morning training sessions, of milestones (my first Olympic distance in August), of mood swings, of food cravings, and of achy muscles. Race day was the delivery day and it was a doozy! Ate Apple Sauce packet. Got dressed and ready. Prepped my bike bottles with Tailwind. On the road by 4:25am. Ate my English Muffin with Turkey, Ham and american cheese and drank my Naked Juice (Berry Blast) with 2 scoops of UCan on the way. Arrived at the parking garage right before 5am. Body marked on the way into transition. Set up transition area. Made sure my pepperoni wraps, honey stinger chews and Huma gels were easily accessible in my bento bag. 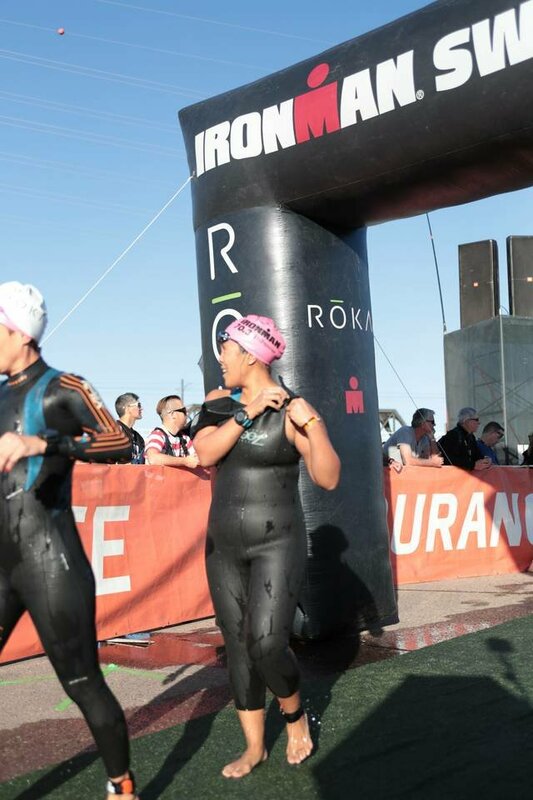 Used the bathroom twice before transition closed and then one last time for shimmying into my wetsuit. I was happy to see friends who were doing the relay before the race started. Ate my Huma gel + 8 oz of water before going into the swim area (6:40ish). Got my last minute pep talk and hugs from Dionne. I was happy that Stacey T. was also in my wave. It was good to have a friendly face to relax with while getting ready to get into the water. 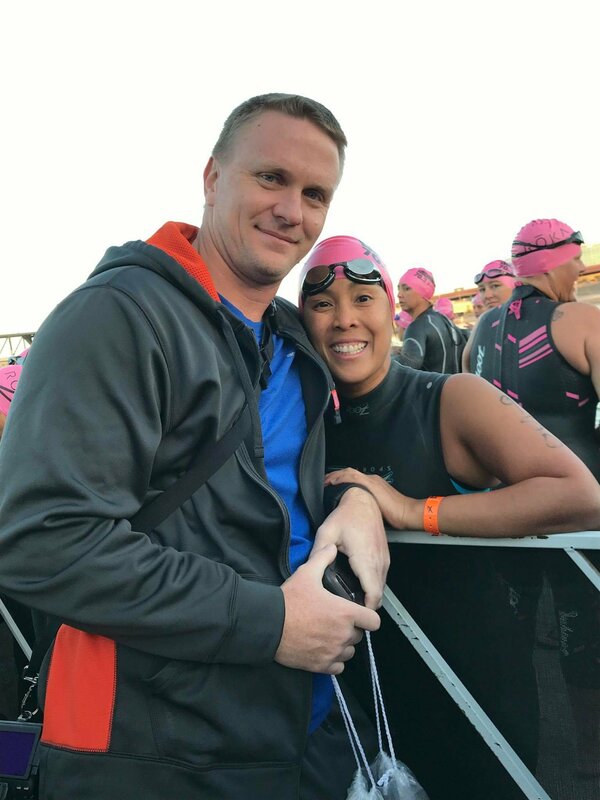 I was glad to see Coach Renee before we got into the water. She gave me the confidence boost I needed. I gave Wes a big kiss before it was our turn to move up and get into the water. That kiss brought tears to my eyes. All the emotions were starting to bubble up to the top. Next thing I knew, it was time for us to move up front and jump into the lake. When we got into the water, I was excited and calm before the swim. I let out a big “whoop” as we were waiting before the countdown. I was feeling ready and excited for it all to begin. I remember how panicked I was the first time I did Esprit de She and how calm I was now. We’ve come a long way baby. I started my watch a few seconds before the start gun went off. When it was time to start, I was trying to keep a slow but steady pace. I knew I was starting off toward the back and I was surrounded by similarly paced swimmers for awhile. There were a couple of ladies that were sandwiching me, but I was able to move away and make some space and keep my pace. When I passed under the bridge I realized that I was too far to the right for sighting. The sun was starting to come up over the buildings/horizon. I started angling over to get to the buoys and just kept watching for the turn. Right before the turn, the next wave of speedy ladies caught up to me. It was a fight to stay close while we were turning. I tried to draft in the swim, but they were speedy. I was thankful that the sun was no longer in my eyes and I kept the pace until the next turn. On this back side the water felt pretty rough. I felt like the wake/wind/current pushed me off line. It felt harder. I was able to keep my eyes on the buoys, but It was like swimming upstream for a bit, so I took the swim one buoy at a time. Once we made the final turn, everyone around me was turning it up for a sprint to the finish. I got clocked in the head, but didn’t panic and made it to the finish. I swam all the way to the step and was helped out by the volunteer. I was bracing myself for the feeling dizzy, but I was okay and felt ready to go. I was happy to see the wetsuit peelers, and once I started moving along I was so excited to see friendly faces and hear all the cheers. I was happy to see so many familiar faces and everyone cheering along the line, especially Wes. I took the concrete part right before the T1 entrance slowly, since I was afraid to slip. I was thankful for an outside bike rack, so I that I ran along the outer edge to get to my spot. 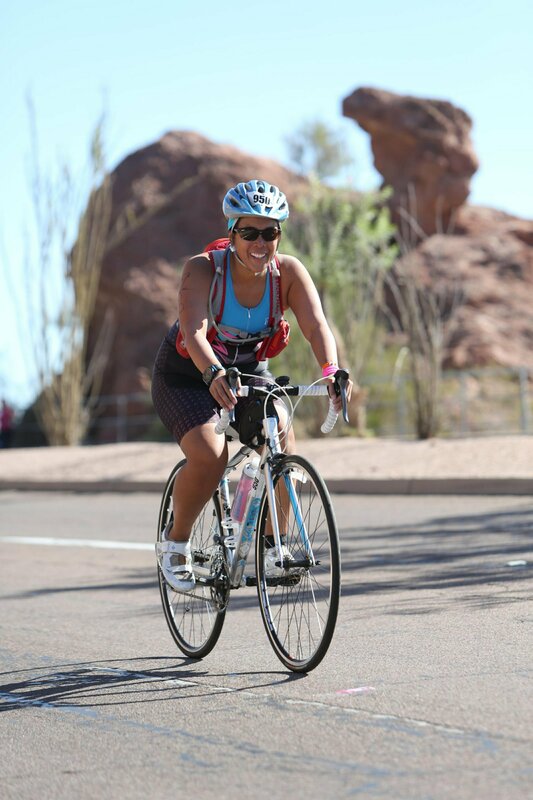 I quickly, wiped my feet and put on my cycling shoes, glasses, helmet and hydration pack. I ran my bike out to the bike mount zone. 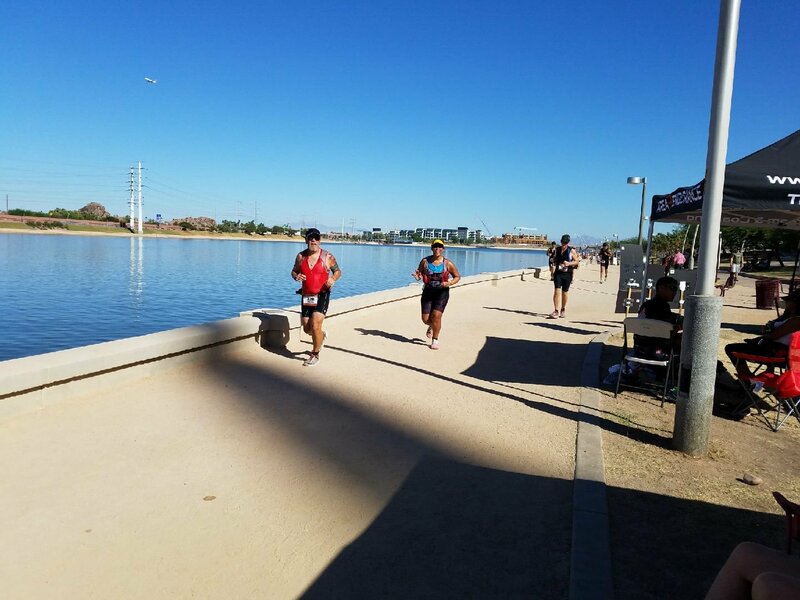 As I was heading west on Rio Salado towards Priest, I checked my speed and I was going a tiny bit fast for my pace, but I felt good and it felt easy to spin. For the first loop of the bike, I was chugging along trying to keep my pace without overexerting myself. I took sips of water in the first 10 minutes and tried to thank all the volunteers and cops along the course. I was able to handle the overpass left hand turn onto Washington (last time I did that turn – Sept 2015, I almost hit the light rail curb). Thankfully I have a little better control now. 🙂 As I came back around to Rio Salado, I was hoping to see Wes at the corner of Rio Salado and Ash and I was so happy to see him there! I knew he was heading home to get the kiddos, so I was thrilled to catch him at that point. I was energized, but cautious as I continued along the first loop. The U Turns on McClintock were tough since there were so many folks on the course. The cop/trooper at the 202 on ramp on McClintock was awesome — he had music blasting from his truck and he was dancing around. By the time I made it to Mill, I saw the 50 miler sign (I called it a liar!) I realized that the next 6 miles would be the hardest… the hills and turns! I had to pass a guy on the right going uphill because he was in the middle of the lane and I was getting passed by speedsters on the left. I was afraid we were going to collide, but thankfully we were okay. Once I got onto Curry, it was more uphill so I just kept chugging along. My watch was set to beep every 10 min so I would take a honey stinger chew or a little bite of my pepperoni wrap. I was also drinking my Tailwind as needed. By the third loop, I cheered for the runners already on the course. I thanked the cop at the top of the overpass. And I could start to feel myself slowing down. I picked up the pace a little bit to maintain my goal speed. At mile 42 I entered the solar oven area and quickly thought this wasn’t fun anymore. I hit the wall and I felt like quitting. 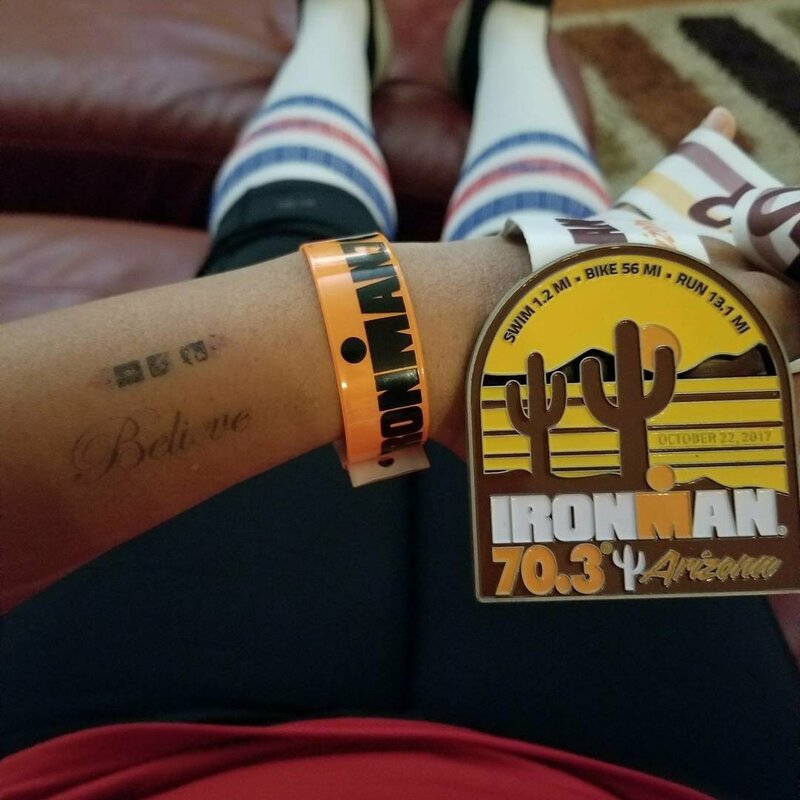 I cried some big sobs for a little bit, pulled myself together and kept moving on the course. By this time, I ran out of water in my backpack so I had figure out where I wanted to refuel. I decided to skip the Rio Salado stop and keep going towards the finish. I just had to finish this loop. My Tailwind was warm, so it wasn’t helping any. When we got to the steepest incline, I was pretty tired. I was in the last 6 miles of the course and finally I decided to stop at the most inconvenient stop (it was on the incline of a big hill – on Curry). I was slowing down, so I decided to walk a good bit up the hill to grab the water. I was able to to refill with water and cool myself off with ice in my tri suit. The volunteers were rockstars and helped me fill up my backpack and my top. I saw Gaëlle several times on this loop, so it kept me motivated to keep moving. When I was approaching the finish, I was able to spot Wes and the kiddos! I was thrilled to see them. This time I removed my feet from both shoes as I approached the dismount line. I quickly I finished the bike course about my predicted time. I was surprised to see so many folks cheering on the bike course! 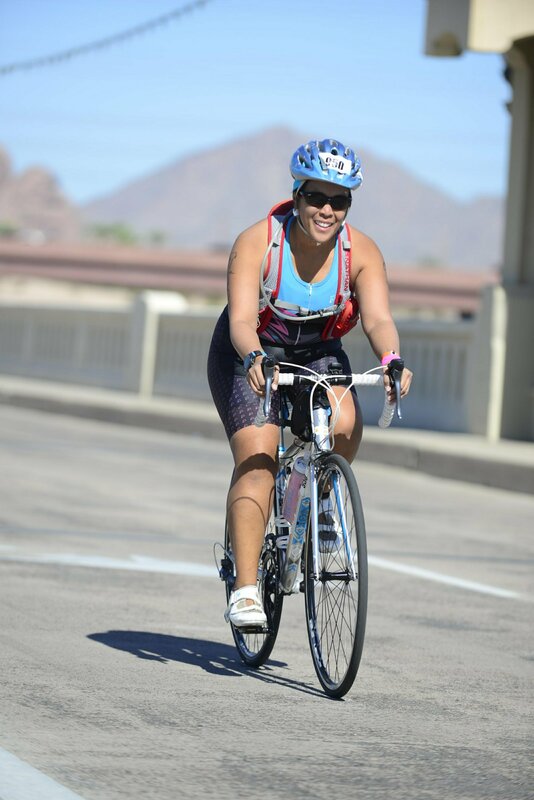 I was so happy to see the bike finish and tons of friends and teammates at the transition. Yay for more cheers and love! I was able to rack my bike quickly, get my socks and shoes on without sitting down. I quickly grabbed my visor and race belt and I was on my way. When I started on the run, Gaëlle had caught up to me, but I couldn’t keep up with her. I kept to my mantra (my race, my pace, my peace). I was feeling good but tired. I made the mistake of looking at my watch. I saw my pace and I panicked when I saw 11:30. I felt like I was moving a little too fast and I knew I couldn’t maintain that speed for the duration of the half marathon. My watch had intervals (3 min run/2 min walk) programmed so I was loosely following that pattern. I stopped to walk and I did my intervals or loosely followed my intervals based on how I felt. By this time it was hot. I met another participant Denny, who was in his first race since a bad wreck in January. He’s going to be 70 next year and he was a rockstar. I also met Monet from the Women for Tri group and we walked together for a little bit. I saw my friend Amy walking the course. I stopped at the second aid station to use the bathroom and I was having trouble zipping it back up. I ended up coming out of the Port a Potty to put myself back together. Thankfully, I was able to zip myself up and walk. At this point, Heather caught up to me and tried to get me to run with her. I tried for a little bit but as soon as my watch beeped I couldn’t keep up with her. I tried to squeeze my glutes as I was walking. I was craving oranges at the aid stations, so I had my fill of oranges and ice water (dumped mostly on my head). By mile 4, Shannon had caught up to me. So I was thankful for her company. We joked at the lying signs (9 mile marker). I kept my intervals with her for the most part. She kept me distracted and it really was great to have a buddy. Once we were closing in on the start of the second loop, she was ready to go and went ahead. I saw my Best Running Friend Elaine with her amazing 🙂 signs and she was playing “Eye of the Tiger” on the sidelines for us. I was happy to see the Wes and the kiddos. I think they were a little disappointed that I had one more loop, but they were troopers! I saw Coach Renee and more teammates and friends. That was the energy booster that I needed. As I started the second loop, I tried to just focus and run when I could. I could feel my energy waning. I took in some Huma gel and I started to feel better. I saw Denny again and he was asking me what my goal time was. I said an 8:00-8:30. I checked my watch and I was at 7:55. I just had to keep on trucking to get to the finish. Becky caught up to me around mile 8 and was my guardian angel for the rest of the run. We walked and ran as my watch yelled at us. We walked in the shade and up hill. We chipped away at the miles, slowly but surely. We saw Dionne as she was up the hill. 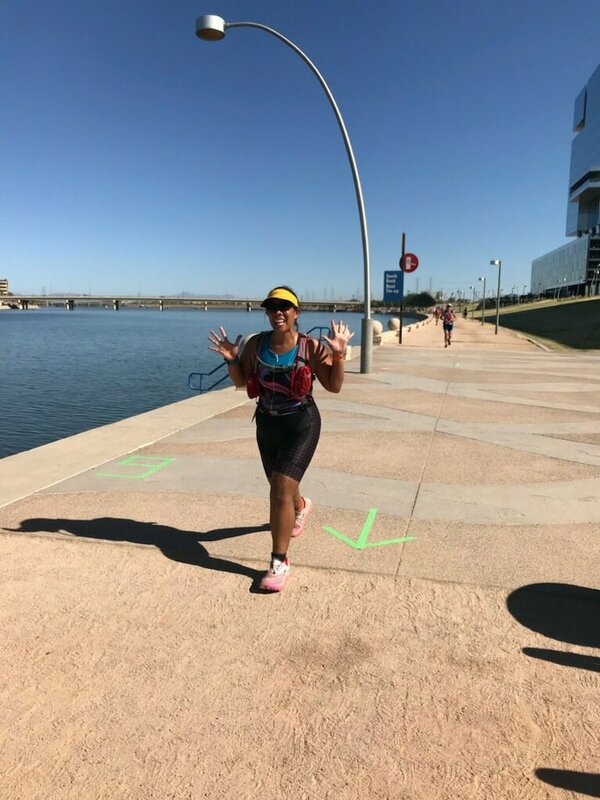 In splash and dashes and other tris, I usually catch up to Dionne on the run this time I couldn’t get my legs moving fast enough to catch her. I wanted to run the last two miles straight, but I couldn’t get my legs moving until we were headed down hill. I saw my Insta friend Jasen and he told me to enjoy the last mile, to take it all in and celebrate this finish! Every step was a celebration of the training and last few months. I saw Elaine and Wes and the kiddos. The kiddos ran alongside the course for a little bit. This got me choked up. I was going to finish! I saw Coach Renee and she told me to take the turn in and finish strong. I turned it up as best as I could. I ran as fast as I could. I got all choked up as I saw the finish line. I stopped for a second before the finish because I was overwhelmed with emotions. 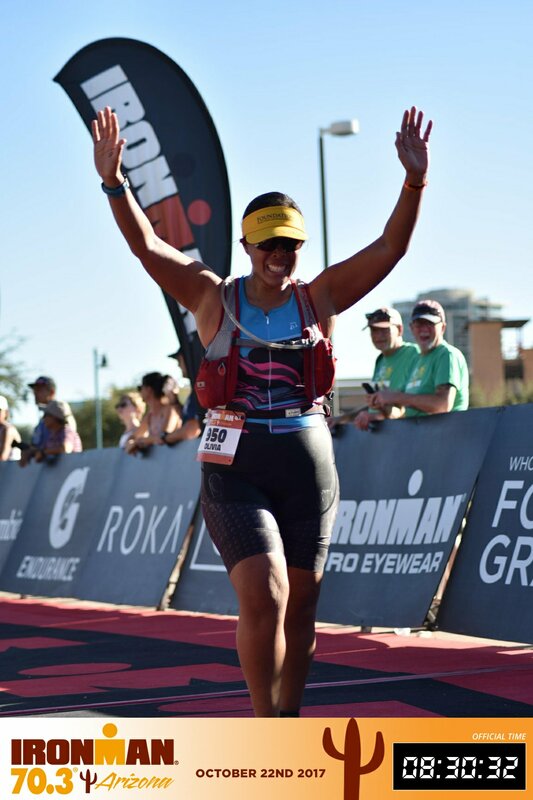 I had accomplished my epic goal of crossing the finish line of a Half Iron Distance Triathlon!! After the race, I thought I would be ravenous. I dropped my post race pizza on the ground but it didn’t seem appetizing anyways. When we got home, all I could stomach was broth with some noodles. Thankfully, my appetite returned the next morning. If I’m going to do this distance again, I would like to have an 11 speed bike. My BFF was amazing and got me to the finish, but there were a couple of times that I wished I had another gear or two in the middle. I thought that I was going to be one and done with the Half Iron Distance, but it looks like I’m going to have to do another one. 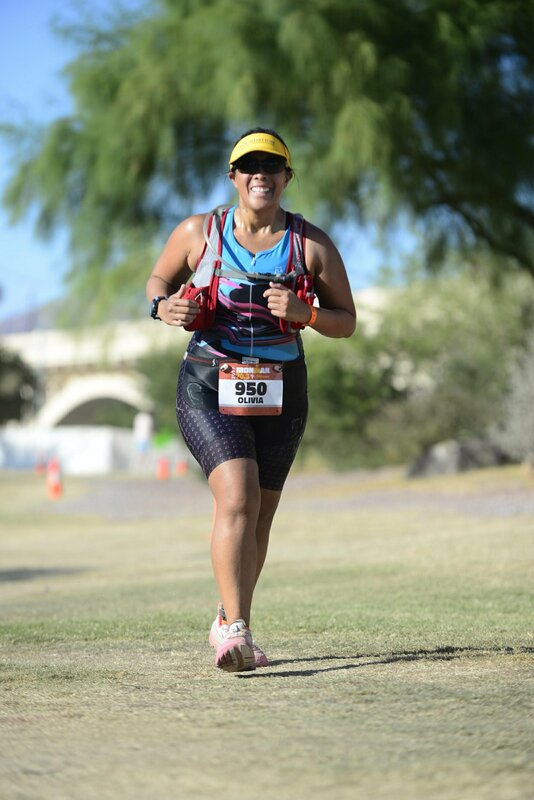 While I was able to finish this race, (I have the photos, the medal and the finisher’s hat to prove it…) I was 33 seconds shy of an official finish. I didn’t finish within the official 8:30 cutoff. 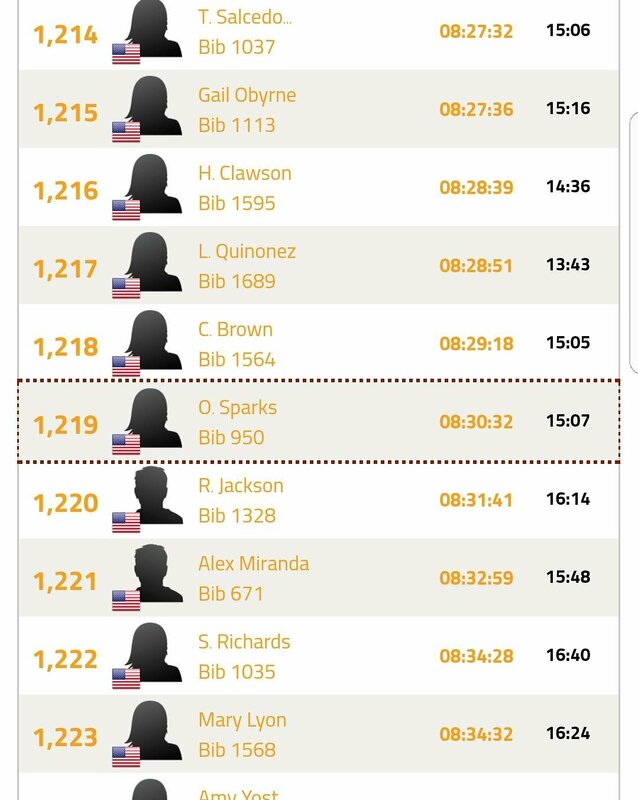 Now that I’ve had some time to celebrate and marinate in my finish, I’m excited to improve my speed and my form in the sprint and olympic distances as well as the runs that I currently have on my schedule. Long course is fun, but it’s not something that’s going to be sustainable for an extended period of time. And nope, at this point I have no desires to do a full Iron distance triathlon. I still have no desire to run a full marathon. But I’ll check back in 10 years who knows what I’ll be thinking then. I am so grateful for my coach, Renee Hodges. She pushed me and prepared me for this race in all aspects and I was able to meet my goal of finishing. She gave me the tools, but it was up to me to use them. She’s always so eloquent and thoughtful in her coaching and her race assessments. 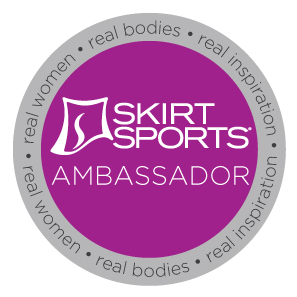 She has a quiet strength about her that I feel like demands the best from her athletes, without being overbearing. She’s a nurturing coach that will tell you what you need to do to improve. 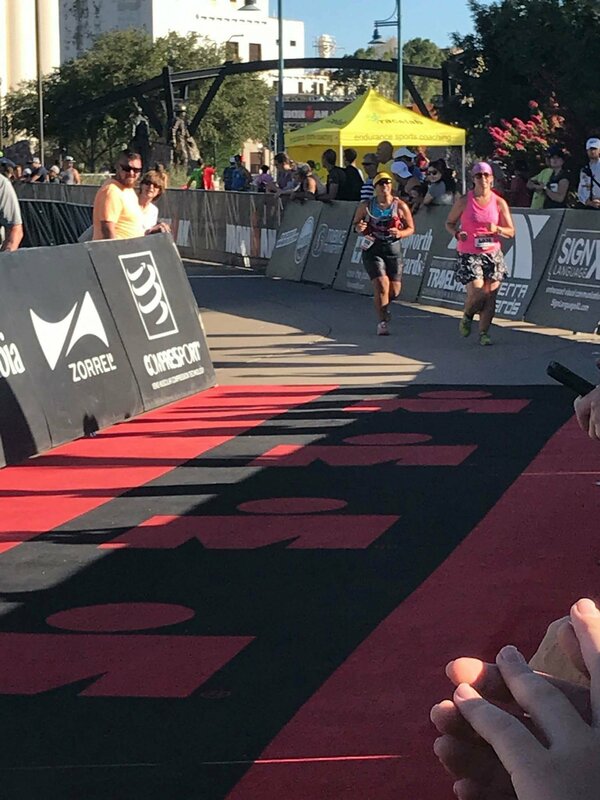 I pushed myself on the swim and the bike, but I could have pushed myself a little harder on the run. Since I’m being completely honest, my strength training exercises were often red on my Training Peaks schedule. I need to make more time for strength to get stronger and faster. I am also most grateful for my hubby, Wes. He was wonderfully supportive throughout the training season. I totally stole his birthday this year with this race. He was an amazing sport about it and was a great cheerleader on race day. This “tri baby” was very much like my first baby’s delivery. I had a natural birthplan and after requiring an induction, that plan went out the window. My C-section wasn’t a failure, the delivery was a success: we ended up with healthy baby and mama. Race day didn’t go exactly as planned, but it was also a success. 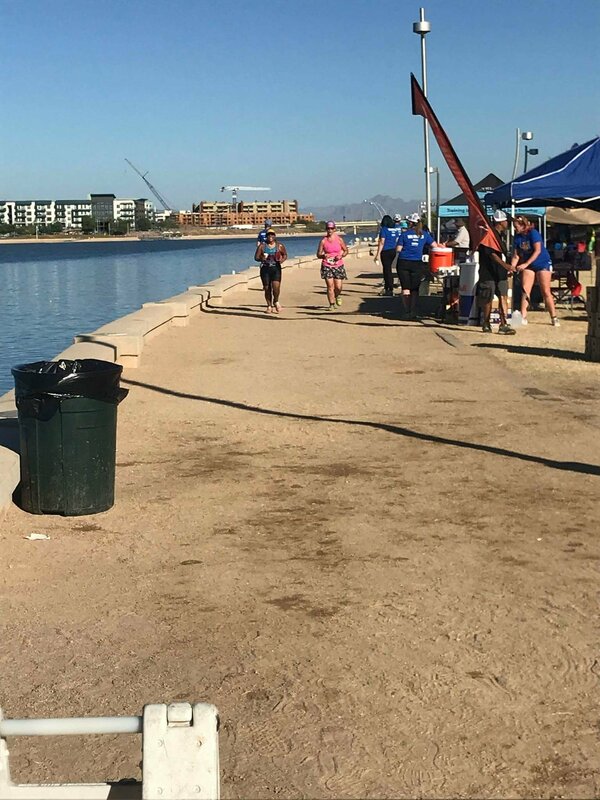 I crossed the finish line and I have pictures and a medal! In the grand scheme of things no one really cares how my babies were delivered. 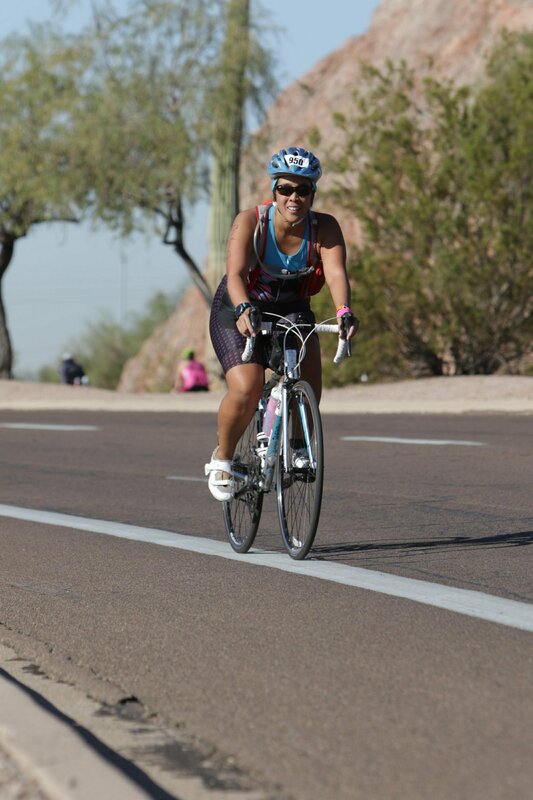 I will always remember the joy that I felt crossing the finish line of #IM70.3AZ and Ironman can’t take that away. P.S. Check me out. 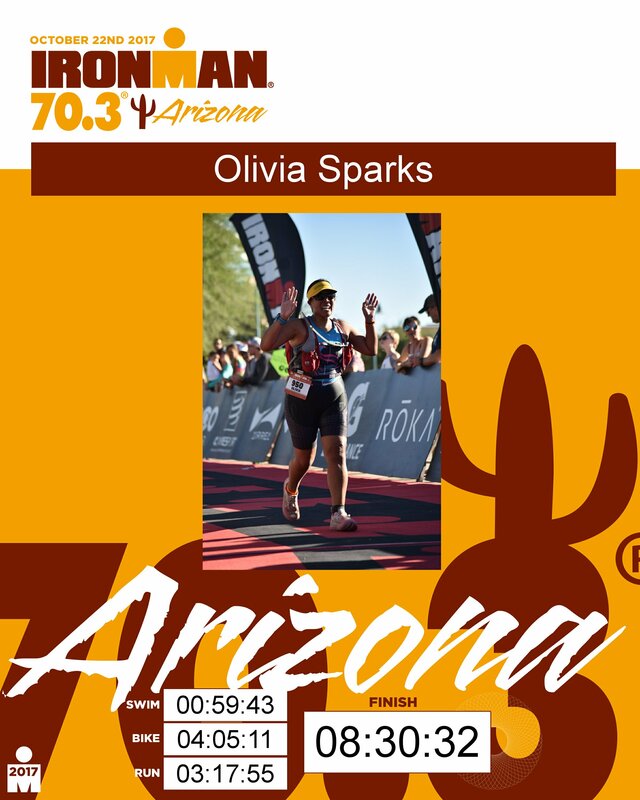 I’m the first “unofficial” finisher! 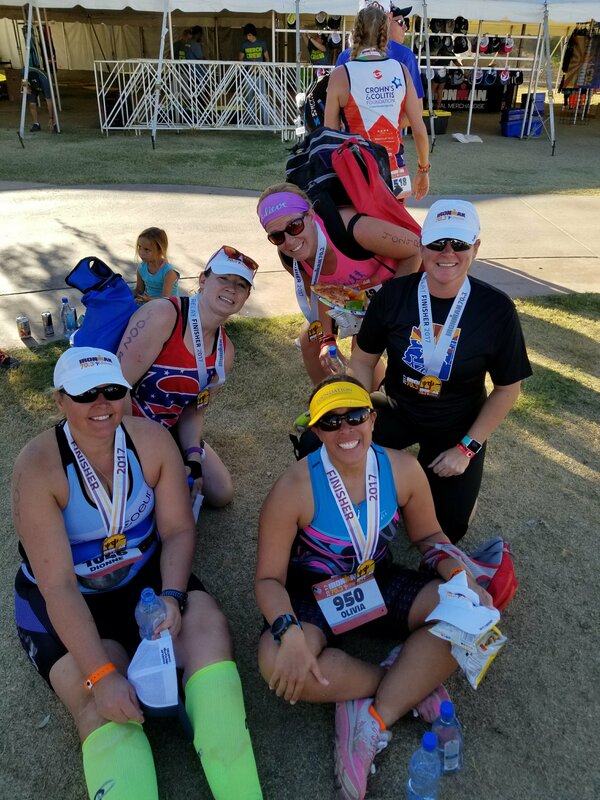 Posted in Races, TriathlonTagged biking, Half Iron, Ironman 70.3, race recap, running, swimming, triathlonBookmark the permalink. I’m so proud of you and your determination! You will just get stronger and stronger! Can we drive the course in Feb so I can see where you actually were?